One of the most beautiful materials used in home decoration, in my view, is porcelain. 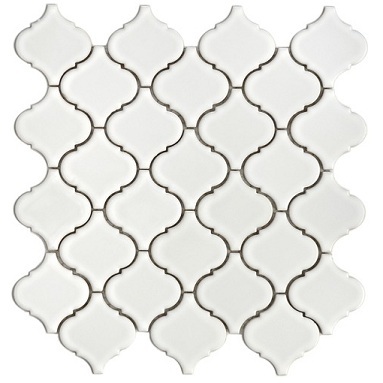 This set of white porcelain mosaic tiles for walls, floors, and counter-tops is ideal for anyone with a fondness of this attractive ceramic material. The tiles have an elegant and old-world style about them which will fit in classical and contemporary settings alike, whether indoors or outdoors. Their curving lines offer an alternative to the regular straight-edged tiling options. The white porcelain mosaic tiles are suitable for a variety of locations. They can be used on interior floors in the kitchen or bathroom. They can also be used in the creation of a backsplash in a cooking or sink area. Alternatively, the tiles can be attached to an entire wall to create a stunning visual feature in a bathroom, kitchen or utility room. One can also make them the surface of your kitchen counter-top. The options are nearly endless. The porcelain tiles have a glazed finish and a uniform appearance, making them a visually pleasing accessory for just about any room. You can buy them from here: White Porcelain Mosaic Tiles. A Berber carpet will always make an attractive addition to a floor in the home. 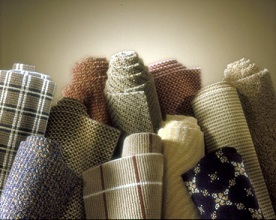 The name largely refers to the type of weave and color that is associated with the carpet and is unique to this particular style. For example, the levels of loops and reduced amount of pile, as compared to other types of carpet, make it distinct and this is also apparent in the high density of the weave that results. 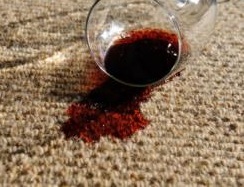 All this makes Berber carpets extremely wear-resistant and long lasting. As anyone familiar with the tribes of North-West Africa will guess, the Berber carpet is named after the nomadic Berber tribes found in this region of the world. These people have used these particular weaving techniques for thousands of years and for a very good reason. By the day, the deserts of North Africa are scorching hot but by night, the temperature can plummet and the air becomes very cold. The tribe’s people thus made use of this fabric to wrap themselves up in during the night and still do to this day. The Berber tribe mostly used camel hair or wool but nowadays, Berber carpets can be found in a variety of materials including olefin and nylon. Most carpets of this type are found in lighter colors and tones such as off-white and cream and this is the traditional style the carpet is found in. However, there are more modern designs which make use of darker colors. The main benefit of Berber carpets, apart from their attractive appearance, is their ability to withstand wear and tear. 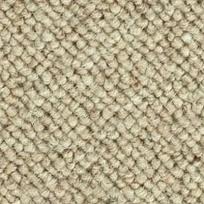 A carpet of this type placed in an area where people often tread, will stand up to the test of time very well. The same goes for the onslaught that is vacuum cleaning. Some rugs can be damaged by the vacuum process, but this isn’t the case with the sturdy Berber rug. That said, if you buy the cheapest type of Berber, then don’t expect it to be as strong as the mid-priced and expensive versions. This is usually the case with any item you buy. The main drawback of a Berber carpet is the fact that it doesn’t stand up well to stains. You can find stain-resistant Berber carpets and these are ideal for more messy areas of the home but in general, the rug will need to be taken to a professional cleaning service if damaged in this way. The dense fibres also mean that any dirt that finds its way into the carpet will be relatively difficult to get out again. If you have cats, it’s also likely to be highly attractive to them as a scratching post due to its particular weave and thus at risk of being unravelled. There are pros and cons to every type of carpet and the benefits and risks need to be weighed up in relation to your home and lifestyle. That said, a Berber carpet is very beautiful and comes to a lot of cultural history behind it. It’s hard to imagine this type of carpet not being a good fit into most styles of home décor. What Kind of Flooring is Best For Your Home Office? Home office conversions are more popular than ever. You may need a home office because of a crossover to working part-time, or it could be a full-time career change. Working at home has its distinct advantages, but you may have to make some adaptations to the flooring in your home office. If you have hardwood throughout your home, then this would work perfectly for a home office. If your preference is for mid-century modern and you love shag carpeting, then this definitely would not work as your office floor. Every room in your home has to tie into the other ones. This means no industrial gray commercial grade carpeting in that home office! The basics of the home office will include: An office desk, an office chair with wheels, a computer, a filing cabinet, and all-in-one printer/scanner/copier, a home network, a phone, and a few cables or two. The only thing movable in that list is the wheeled office chair. Some chair wheels may create damage on your floor so if you’re in doubt about that, then place a chair mat down right away. Office desks can also be heavy, as can full filing cabinets. Think about the weight that’s to be placed on your office floor. If one of your goals for your home office flooring is that it lasts a long time and looks great real hardwood is a top contender. Engineered hardwood will come in a close second. You can’t beat these two for longevity and quality. Some hardwoods are exotic, but that’s not really needed for an office because you’re covering it all up with your desk and chair and other things, anyway. Soft coverings like carpets, or carpet tiles, or some forms of cork flooring, often will not stand the wear and tear of a work environment so they will not work for an office. There are newer varieties of cork which will work which are more robust. This is also a very renewable source for flooring because cork oak trees are not killed when the cork is harvested. The subject of laminate is often brought up when anyone talks about flooring. Cheap laminate is not a good thing to have on your office floor. It can sound hollow and if you’re rolling around on it all the time, a person in the room beneath you, could be driven crazy. I am not fond of laminate in any case, but it can be quite reasonably priced and if you have padding underneath it, then the hollowness will more than likely go away. Today’s laminate is much better than kinds that homeowners used to be able to get. I suppose it depends on the quality of laminate but it’s quite low on my list of choices for a home office floor. If you do choose laminate, check the box to see if it’s free from VOCs, these can cause reactions in the chemically sensitive. 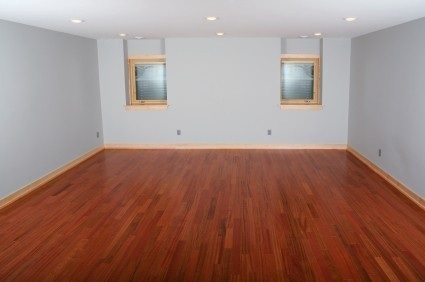 If you bought a home that’s a few years old, then some of your flooring could be a total mystery. It’s always good to know what you’re stepping on and breathing in, so getting an expert to determine what’s underneath your feet can be a good idea. If you’re unsure of what your flooring is, and you don’t like the look of it anyway, then have someone install another kind of flooring or you can do yourself, also. If you’re busy in your home office and even if you’re a financial wizard, flooring design and structure and use may escape you. An option is to call in a designer and tell them that you want to use the room for a home office, and ask them what they would recommend. 1.evaluate how your home office will look in the rest of your house. If it’s closed off then it may not need to have the same flooring that the rest of the house has. 2. the flooring has to fit the furniture (if you’ve got it already) or the furniture has to fit the floor. If, for instance, you have an exquisite executive cherry computer desk then its unlikely that a cork tile floor is going to do it justice. Having said that, function and not form is the main goal for your home office. If you have everything you need there, and the equipment works smoothly, and the flooring is functional as well as pretty, then all the better and that’s a bonus! Lloyd Burrell writes reviews on home office desk furniture. Whether it be a modern l shaped office desk or a more traditional rectangular model, Lloyd has detailed reviews on all these desk styles and more so that you can make the right choice. Anyone who owns a carpet or rug will attest to the perils of holding a party. No matter how meticulous you are at moving poorly placed wine glasses or if you have tried to cover every cream bit of fabric in the house; something will always get spilled. The main thing to consider therefore is how to get some of these more common of stains out. There are so many theories when it comes to removing/minimising stains that seemingly everybody has a different technique (most untested and inherently wrong). We have taken it upon ourselves to outline what we consider to be the best way of dealing with the most common of party stains. As we are currently in a bit of a festivity dry period at the moment, so brush up now or forever live with that strange brown stain! Beers stains are one of the most common party stains, whether it is from lots of half empty glasses being precariously placed or due to over excited dancing a stain from this most ancient of liquids is hard to avoid. To remove try creating a mixture of one teaspoon of detergent, a teaspoon of white vinegar and 1000ml of warm water. This mixture is good to use on the majority of fibres including nylon, olefin, polyester, wool and acrylic. More often than not you have no idea where it came from, or why someone was applying lipstick that close to the floor. Lipstick is an oil based stain, which is good to keep in mind when trying to treat it. A good first trick is to blot the lipstick with alcohol gently, if you keep this up it should take the stain out. Otherwise find a detergent which has a grease fighting formula, apply it to the stain and leave for 10 minutes. Once the set amount of time has elapsed work at the stain with warm water from the outside inwards. This is probably the classic party stain and the one where so many different stain removal techniques are suggested. It always amuses me (if it isn’t at my house) that the probability of a stain usually increasing as the night progresses. The tried and trusted process should be to firstly blot out the stain as quickly as you can with paper towels. Then combine a teaspoon of laundry soap and a cup of hydrogen peroxide in a bowl and dab the stain with a new sponge. Then put a dry towel over the stain and gently dry. Once dry, if the stain remains wash again gently with a bowl of warm water and laundry detergent. We all know ketchup stains are tricky to deal with and sometimes we only get to see the stains once they are dry. The key to dealing with a ketchup stain is getting to it as quickly as possible and gently scraping as much up of the material. If the stain is dry gently wet it with warm water once ready add ½ a teaspoon of detergent or carpet cleaning solution into a litre of cold water. Soak a cloth in the mixed solution then lay the damp cloth over the stain. Use the back of the spoon to massage the stain using a spiral pattern from the outside inwards. Remove the cloth and spray warm water onto the stain, remove the excess water then dry using paper towels or a cloth. Most of you will have come across this stain, and I would guess the majority of you found it pretty tricky to remove. Initially it seems to come away quickly, but it is extremely tricky to get rid of it totally. To start with try to soak up as much of the spillage as possible using kitchen towels or a cloth. Next create a solution of a teaspoon of white vinegar, a teaspoon of detergent and 1000ml of warm water. These ideas are brought to you in association with The Rug House. The Rug House are one of the UK’s biggest stockists of large rugs, make some incredible savings by checking out their latest rugs for sale. All The Rug House rugs have a price match guarantee too, meaning if you find a rug cheaper elsewhere in the UK we will match it. Okay so you are looking to replace your old carpet? Or you might have a tiled floor, or a laminate floor that you want to replace. So first of all what do you need to consider when buying a new carpet? After all how hard can buying the right carpet be? Well you are right and if you take a few simple steps and do a bit of research then buying a new carpet is easy. But it is very easy to be taken in by a special offer in a carpet showroom and buy the wrong carpet. This does happen and if it happens to you, it will be costly as you may well end up buying another carpet just a few months later. Firstly you should consider that you will get a far better service if your chosen carpet company comes out to you, rather than you simply taking your room measurements to them. The reason for this is that they will be able to bring along samples of underlay, and even gripper rods. Both of these items can be essential to a good carpet fitting. You may as an example have an old carpet that needs replacing, and if it does the chances are that the underlay and the gripper rods will do as well. Fitting your own carpet is not advised for the above reasons. Laying carpet is a specialist skill and whilst you could save a few pounds by laying one yourself, you then still have to think of the time it will take to rip up the old carpet, underlay and gripper rods, and then if you cut the carpet wrongly you may have a major problem! Also who will dispose of the old carpet – doubt it will fit in your car! By using a “Full service” carpet company, they will be able to remove your old carpet, underlay and gripper rods. They will then lay down new rods and underlay to a professional standard, ensuring that when your new carpet is laid down, it is to the highest of standards. Also by having a carpet company come to your own house they will also be able to advise on the correct grade of carpet you need. This may sound simple but if you buy a cheap roll end of carpet that is not designed for use in a shower room, but then place it in one, you will then find it is constantly damp and lets water through to the flooring below it. So when choosing carpet always use a specialist, do not risk buying the wrong carpet on your own. This article comes from Beautiful Flooring, a collection of quality flooring retailers across the UK – Buy carpet online or visit us in-store.